Did the employee actually send this to my friend from the goodness of his heart? Or is there something else going on here? After some research, I found out that Coach is in the process of “redefining” its brand in North America. Coach was the leader in the North American handbag market. However, recently before the recession, brands like Michael Kors, Tory Burch, and Ralph Lauren Corp moved in and grasped margins exceeding 50 percent. Coach then, came out with the new ‘Lifestyle Strategy’. But more on that later. First, what is it that makes a luxury brand desirable? In the world of luxury brand marketing, the main factor we tend to look at of our consumers is their income and their assets. While this tells us their ability to purchase the luxury product or service, we know nothing about their thought process and their motivations to spend their wealth on luxury products. Luxury brand marketing is considerably different from traditional marketing where you would just consider the 4 P’s. Most marketers believe they understand the elements that make up the desirability of a luxury brand. Although necessary, these are features that marketers and businesses would rely upon in the past. While these are all common elements of luxury brands, there is a deeper side to luxury branding. The consumer’s of today are smarter spenders, more selective, more opinionated, and judge based on other elements as well. If you understand the psychology of the consumer, you can cater your resources to focus on bringing the consumer towards you, as opposed to spending your resources on sharpening the quality, price, exclusivity, scarcity, etc.. and HOPING your consumer moves towards you on their own. There is a difference between waiting for your consumer and inviting the consumer. When it comes to the luxury driven consumer, effective strategy entails inviting them and calling them to your brand. The wealthy are used to being invited. It’s attesting to their status. We know the importance of a brand story. For the luxury conscious consumer, the story plays a huge role in engaging the consumer. Through engaging them, you INVITE them to join your brand’s journey. Luxury brands have a rich history, a uniqueness, a legendary story which contributes to the brand’s personality. Joining that brand’s community is enticing. Joining Coco Chanel when she started her business in 1913 to becoming a revolutionary couturier, is enticing. Joining Tom Ford in his journey from being a common man, from struggling for achievement, to triumphing in his masculine destiny, is enticing. Both Chanel and Tom Ford consistently leverage its brand personality and uniqueness in their marketing strategies. Usually with the help of celebrities. One of the few rational arguments that would prevent consumers from making a purchase would be the price – sometimes for some consumers, price can precede everything, no matter how much you position your brand strategically. However, although price communicates perceived value of the product, luxury brands cater to a consumer that can buy almost any material thing that he or she wants. The product or service itself, then becomes secondary.Therefore, the main rational argument that could be a barrier in your consumer purchasing from you, is gone. What’s important now is how you position your product to appeal to the emotional brain of your consumer. Focus your resources on your emotional strategy, especially when marketing luxury brands. Burberry consumers want to feel ‘authenticity’ and ‘timelessness’. Tom Ford consumers want to feel ‘triumphant’. Tiffany consumers want to feel ‘love’. So back to Coach and their new ‘Lifestyle Strategy’. Do you think Coach is on the right path to regaining its market share? The note ENGAGES my friend on a very personal level; the note is hand-written, it mentions the salesperson and her experience together, it has a ‘gift’ which is a HUGE sign of caring. This entire gesture is oozing with the message that COACH cares about YOU. What else comes in the mail directly to someone in an envelope, in a card-like format? How about an invitation? 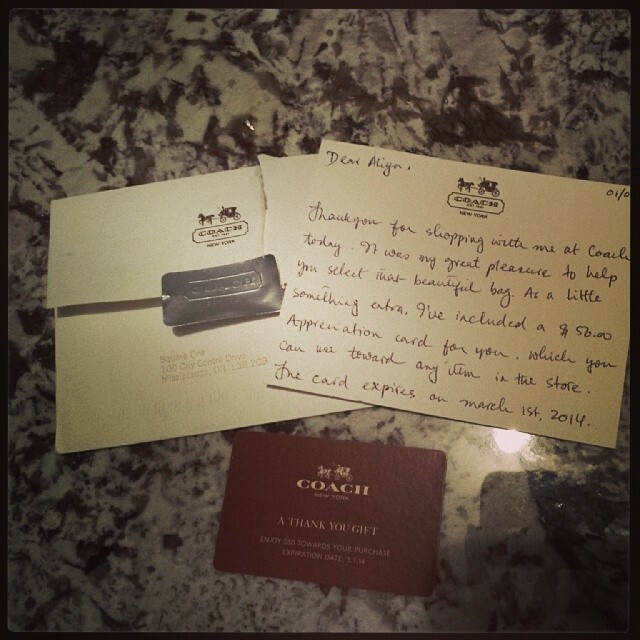 By implementing this simple, sophisticated marketing strategy, it’s pretty evident that Coach understands their luxury-conscious consumer. Struggle is a part of every brand’s journey. It’s how you adapt and differentiate yourself that makes the difference. More importantly, and especially when it comes to luxury branding, it’s when you think of your consumer, their thoughts, their values, their psychology, that you can create the most effective strategies to rise to market leadership.